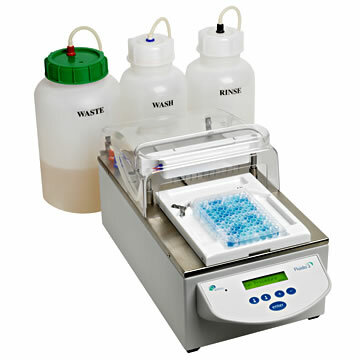 "Fluido2 Microplate Washer – two channel washer"
An affordable automated microplate washer to save time manually washing microplates. The Biochrom Anthos Fluido 2 Microplate Washer is a top-loading instrument ideal for both absorbance and luminescence microplate-based assays. The liquid handling and dispensing capability along with software control give optimal washing performance and ease of use. An 8-channel manifolds is supplied as standard for use with standard ANSI SBS footprint 96-well plates. 12-channel and 16-channel manifolds for ANSI SBS footprint 96-well plates and 384-well plates respectively are available as optional accessories. Upto 4 different liquid lines can be used allowing flexible configurations e.g. 3 wash and 1 rinse or 4 different wash solutions. The Biochrom Anthos Fluido 2 Microplate Washer is configurable to a range of microplate formats to maximise flexibility in assay usage. Upto 8 cycles can be incorporated into each cycle, plus 20 different wash cycles can be defined including; bottom and overflow washing options, adjustable dispense volume and speed, adjustable aspiration speed and time, and adjustable soak time. Washing procedures can be performed over the whole plate or be limited to a few strips of wells. Efficient washing is achieved by cross-wise aspiration minimising the residual volume in the wells. Three modes of shaking are available to mix solutions. The instrument mechanics consist of a vacuum-free and pressure-free system with quiet pumps, meaning that no special bottles are required. A number of safety features have been incorporated into the instrument: an emergency stop function will stop the instrument running and prevent damage to the microplate, a hinged transparent plastic shield provides aerosol protection from the samples during washing, and optional liquid level warnings and liquid level sensors.